Notes: No spoilers here. 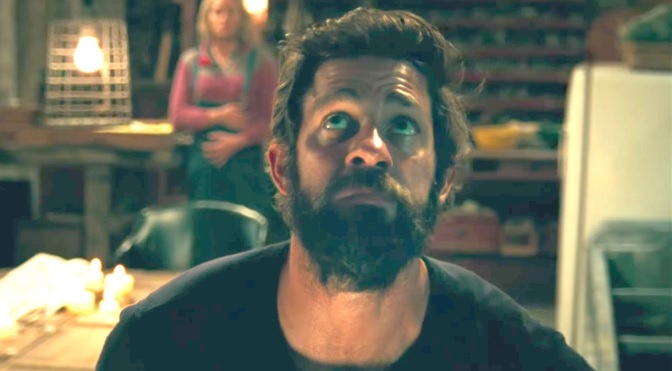 A Quiet Place is a horror-thriller, but know that audiences can get very emotionally invested in this involving plot, which can be upsetting. This film is also an interesting experience that puts a movie theater’s audience under the microscope because viewings are greatly enhanced in a quiet environment with no distractions. American Sign Language (ASL) is used extensively with subtitles. Set in 2020 in a non-distinct rural area, A Quiet Place maximizes showings with a 90-minute running time as well as an incredible film experience on a 17-million-dollar budget. Audiences experience a family surviving in their rural home after alien creatures have seemingly conquered the Earth. The screenplay, co-written by John Krasinski (13 Hours: The Secret Soldiers of Benghazi, TV’s The Office) with story writers Bryan Woods and Scott Beck, only explains the family’s situation and what they encounter. The plot, structured in a timeline among several days, produces a plausible experience for the audience… one where they do not question this experience and can fully escape in it. The military and scientists have no presence in this film, but hints from various media sources provide some insight. Krasinski directs, executive produces, and stars as the survivalist-minded Lee Abbott while his real-life wife, Emily Blunt, plays Lee’s wife Evelyn. The expert casting continues the Abbotts’ children who perform well in star-making roles. This casting pays off in several ways, especially in relating to the ASL communication and the realistically emotional scenes between Lee and Evelyn. This couple supports each other so they can provide hope. Audiences don’t even know what Lee and Evelyn’s professions were before this time, which helps audiences focus on current actions and scenarios. The alien creature design ignites the audience’s imagination and prompts constant questions about their senses and abilities. The creatures’ ruthless menace and mysterious origins match well with the Abbott family’s basic struggles to survive. Audiences never really see any detailed perspectives from the creatures’ point-of-view until the end, but filmmakers expertly use sound and sight to put audiences into the family characters’ perspectives, especially Regan who is well played by Millicent Simmonds. Simmonds is deaf in real life, which is why ASL is used extensively throughout the film. A cochlear implant (not a hearing aid) also prominently factors into the plot. The Abbott’s boys Marcus and Beau are played by Noah Jupe (The Night Manager miniseries) and Cade Woodward in his feature film debut respectively. Obedience, fear, logic, desire, innocence, guilt and raw instinct all play key roles in character actions. This film was well planned and filmmakers analyzed each intriguing scenario incredibly well. The pace and tone work perfectly. Filmmakers use lighting, sound and set production to create impactful visual elements and shots. One beginning sequence echoes 9/11 while other details comprise into an effective overall picture. More natural elements play a bigger role later in the plot, which are hinted at during the main title sequence using special effects. It’s tempting to outthink the film, but each element is well justified. For example, I thought I would keep big stones to throw in other areas to distract the creatures when I’m in a crisis, but these creatures cover ground very well so that strategy really would not have worked well. Sonic personal devices or alarm systems? … maybe. Hopefully filmmakers will get creative with these and other deterring technological possibilities in a likely sequel. Sequences involving sound defense tactics attempted by the military and scientific fields would be essential in a possible prequel. The expert filmmaking deserves considerable credit, especially cinematographer Charlotte Bruus Christensen and editor Christopher Tellefsen though there was a noticeably odd edit in a grain silo sequence that detracted a bit from this quality experience. The musical score by Marco Beltrami plays a huge role as the source of most sound due to the extraordinarily low frequency of character dialogue. If considerate viewers want to enhance the viewing of this film for their fellow viewers in the theater, then be prepared – this movie will not ideal for loud, immature and/or fidgety viewers. Filmed in various areas in New York, A Quiet Place reaches incredible levels of tension and suspense from the talented cast with equally effective character development and personal emotion for a highly recommended experience (***1/2 out of four stars) that audiences can easily and deeply invest in. Rated PG-13 for for terror and some bloody images and produced by Michael Bay’s company, Platinum Dunes. Shot in 36 days, A Quiet Place echoes elements in M. Night Shyamalan’s films, Tim Lebbon’s The Silence and the Alien film series, but does not plagiarize or reconstitute them. Not to be confused with the Ronny Dörfler 2016 film short of the same name. Paramount originally developed this film as a Cloverfield film series installment. The film is also an example, and, if people participate in viewing it, a notable and welcome exercise in counterculture among a society full of loud, fickle and obnoxious actions. Audiences will be talking about this film long after the ending credits roll. I was hoping to applaud my theater for being quiet during my viewing, which would have created an enhanced experience, but instead got several unnecessary, distracting noises. Even a staff person off to the side had her phone going off, etc. I just tried to tune it out. Theater concessions personnel could get creative by offering more “ninja foods” that can be quietly consumed (e.g. more gummy candies) for their showings of this film. Some movies you just have to watch alone, which is almost impossible during this current theatrical run, so I look forward to watching this film again alone at home with no distractions. 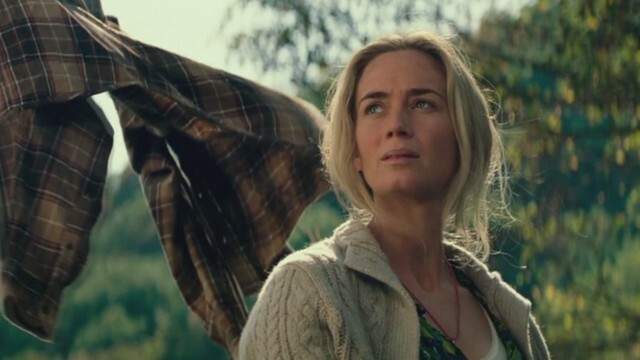 This entry was posted in 2010s Film Reviews, Film Reviews and tagged A Quiet Place, Emily Blunt, Film, John, John Krasinski, Michael Siebenaler, Mike Siebenaler, Tall Writer, thriller. Bookmark the permalink.